Plant-based diets for better health and planet? Forget all those loud calls to eat less meat and more plants for better health and a stronger planet - new research shows the world is not producing nearly enough fruit and vegetables to feed everyone. Canadian researchers compared global agricultural production with the sort of diet backed by nutritionists - and favoured by environmentalists - and said they found a "fundamental mismatch" between what is being produced and what the world's population would actually need. "We simply can't all adopt a healthy diet under the current global agriculture system," the study's co-author Evan Fraser said in a statement. "Results show that the global system currently overproduces grains, fats and sugars," added Fraser, director of Arrell Food Institute at University of Guelph in Ontario. But it is short of fruit and veg, he said. Recent research has urged consumers to eat less meat as a way of feeding the world's growing population without causing irreparable damage to the environment. Livestock are responsible for about 14.5% of global greenhouse gas emissions, according to the United Nations Food and Agriculture Organization (FAO), and scientists say eating less meat could help. The world risks sweltering heatwaves, extreme rainfall and shrinking harvests unless unprecedented efforts are made to keep temperature rise to 1.5°C, according to the United Nations. The Canadian study, published this week in the scientific journal PLOS ONE, calculated how much food was being grown compared to what is recommended by the Harvard University's "Healthy Eating Plate" guide. The guide recommends fruits and vegetables should form half of any diet, whole grains 25% and protein, fat and dairy make up the rest. 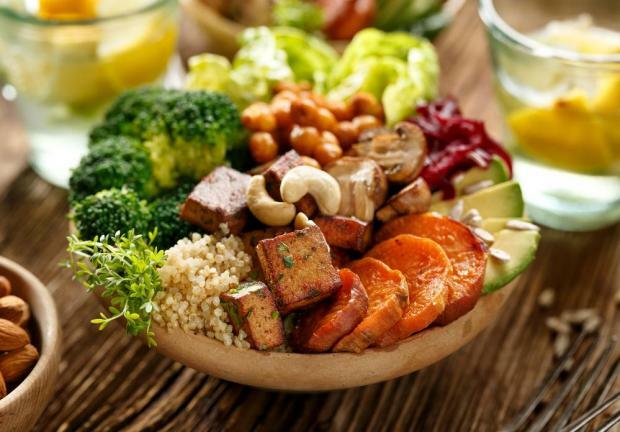 It broke down food groups into portions and found the world currently produces 12 servings of grains per person instead of the recommended eight; five servings of fruits and vegetables instead of 15; and four servings of sugar instead of none. If neither diet nor farming practices change, the world would need 12 million more hectares of arable land and some 1.3 billion more hectares of pasture land by 2050 to feed a projected population of 9.8 billion, the study added. Lawrence Hadad, executive director of the Global Alliance for Improved Nutrition, said fruits and vegetables were becoming more expensive due to thin demand, low productivity and high losses in storage and transport. "To change this dynamic, fruits and vegetable consumption would have to be given a high priority by governments in nutrition and health plans," he told the Thomson Reuters Foundation. Governments worldwide have promoted a range of healthy-eating policies, urging increasingly obese populations to replace sugary and starchy processed food with more fruit and vegetables to increase longevity and improve overall health. Fruits and vegetables are central to combating all forms of malnutrition but nearly all of agriculture research and development is focused on cereals, added Hadad, co-winner of this year's World Food Prize, founded in 1986 by Nobel laureate Norman Bourlag and dubbed the Nobel for agriculture.